I got the original Gorillapod almost a year ago for my Powershot A80. At the time it was the only model they offered. In theory, the A80 is under the official weight limit... In practice it's not very steady. I've found that the Gorillapod is still good for setting up the camera on a variety of non-flat surfaces, but it is not useful for long exposures, and I'd be scared to use it at all in a strong breeze. If I had a smaller camera (like the SD 700) or the newer (sturdier) Gorillapod-SLR it would probably get used quite a bit... As of now it mostly sits in the bag and I just use my UltraPod II. I'm a big fan of the Ultrapod II, and have discussed it many times on this site. It's a great tripod. 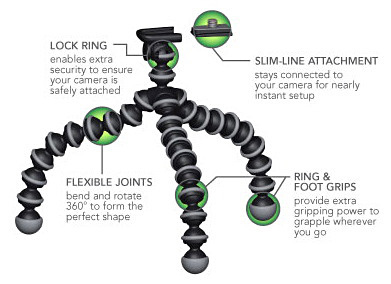 But I must say that my experiences with the Gorillapod have been better than yours. I've captured both movies and long exposures with great ease and of good quality with my Canon SD 700. I like this little creature quite a bit.